Can a jellyfish sting be fatal? Today’s Wonder of the Day was inspired by Jayden. Jayden Wonders, “Do jellyfish have bones?” Thanks for WONDERing with us, Jayden! Despite what the residents of Bikini Bottom might have you believe, jellyfish don't really produce delicious jelly. In fact, jellyfish aren't really fish at all. Jellyfish are very simple sea creatures that have lived in the oceans since before the time of the dinosaurs. Found in every ocean around the world, some jellyfish live in deep, cold water, while others prefer warm, shallow coastal waters. Scientists believe jellyfish have been around at least 500 million years. Members of the scientific phylum Cnidaria, jellyfish are considered to be plankton and are closely related to sea anemones and corals. Since jellyfish aren't really fish, many scientists prefer to call them "jellies" or "sea jellies" instead. Floating along on an ocean current, jellyfish can be mesmerizing to watch. Their elegant and colorful bodies seem so mysterious. Take them out of the water, though, and they become boring blobs. Why? Their bodies are more than 90 percent water! Jellyfish don't have bones, brains, hearts, blood, or a central nervous system. Instead, they sense the world around them with a loose network of nerves called a “nerve net." Jellyfish consist of three basic layers. The outer layer, called the "epidermis," contains the nerve net. The middle layer is made of "mesoglea," the thick, elastic stuff that looks like jelly. The final, inner layer is called the "gastrodermis." Inside their bell-shaped bodies, jellyfish have a large “mouth" where food comes in and waste goes out. Jellyfish eat fish, shrimp, crabs, small plants, and sometimes even other jellyfish. They squirt water from their mouths to move themselves through the water. The most recognizable feature of a jellyfish is its tentacles that hang down from its body. Fascinating to look at, these tentacles can be dangerous to touch. Jellyfish can sting with their tentacles. They use them to stun prey before they eat them. Jellyfish don't purposefully attack humans. Most jellyfish stings occur when someone accidentally touches a jellyfish. Even a dead jellyfish can sting! How harmful a jellyfish sting is depends on the type of jellyfish. Some jellyfish stings have little or no effect on humans, while others may cause minor discomfort to extreme pain. 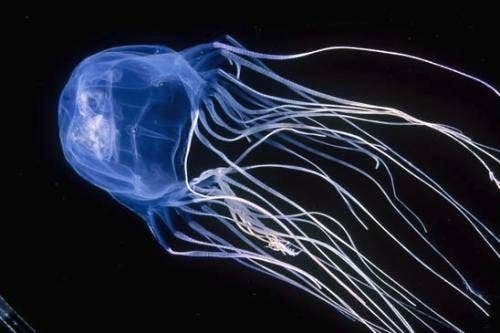 The sting of a few types of jellyfish, though — such as the Australian sea wasp, the Irukandji, and the Portuguese man-of-war — can be potentially fatal. A group of jellyfish can be called a "bloom," a "swarm," or a "smack." 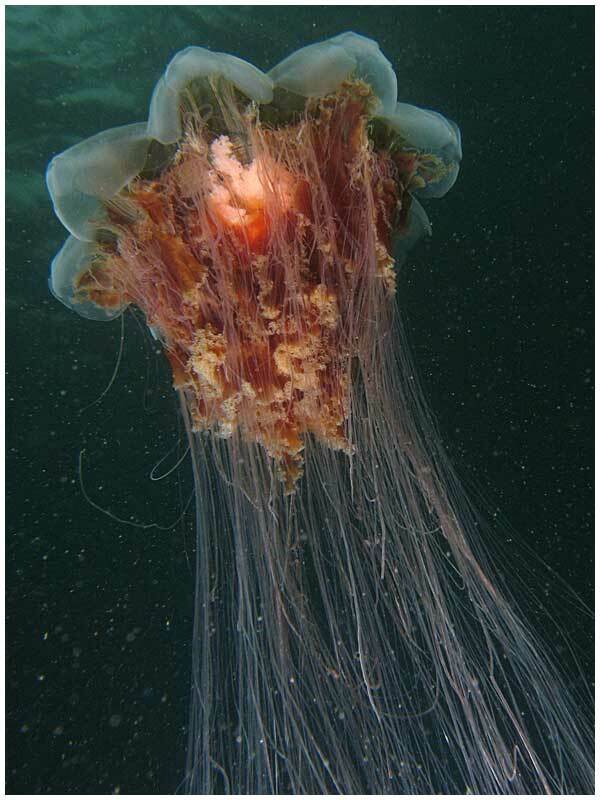 The lion's mane jellyfish might be the longest animal in the world. Its thin tentacles can reach up to 120 feet long. The Nomura's jellyfish might be the largest jellyfish. Average specimens weigh 330 pounds, and the largest can reach 440 pounds. Tomorrow’s Wonder of the Day takes a closer look at amazing animals that lend a helping paw! Feeling crafty? Jump online to check out the fun Plastic Bag Jellyfish craft. You'll need just a few simple materials to make your own personal jellyfish in a bottle! If you could keep a jellyfish as a pet, would you? Why or why not? Visit the National Geographic website to view their beautiful Jellyfish photo gallery. You'll be able to view several different types of jellyfish. Which do you think is the most interesting? Why? Squidward, Are you not telling us something? Why does it hurt when a jelly fish stings? Hi, Serena! We're glad that you found this Wonder so you can learn more about what jellyfish are made of! What did you discover? Great question, bob! Jellyfish stings are not like bee stings, and this article by kidshealth.org will help explain why! Let us know what you discover! Jellyfish can't be made with jelly. I 've never seen jellyfish made of jelly. You are absolutely right, Nicholas! To learn more about what jellyfish are made of, we hope that you read through this Wonder - let us know what you discover! Hi, Kaiser! For more information about jellyfish, we hope that you visit our Wonder Sources at the bottom of this Wonder! We're so glad to hear that, matilda! You might also be interested in Wonder 1487: Can Anything Live Forever? We agree that jellyfish are fascinating, but can also see where they could be creepy!! Thanks for sharing, Cora!! We agree with you, jaedyn! They're beautiful to WONDER about...from a distance! We're glad you enjoyed WONDERing about jellyfish, jaketherock! Have you ever seen a jellyfish in person? When I went to the beach, I saw a jellyfish. I think it was dying. I felt bad, but I didn't want to pick it up, because I did not want to be stung. We're glad that you didn't try to pick the jellyfish up, Kimberly - that could have been very painful! How do jellyfish hide themselves? I saw a clear jellyfish once. Thanks for sharing your connection, Kimberly! How big is the largest known jelly? Wouldn't it be cool if it were 50 ft wide! Can jellies come in any shape and color? Jellyfish and peanut butter fish sandwich. Mmmmmmmmmmmmmmmmmmmmmmmmmmmmmmmmmmmm! Are there any more kinds of jellyfish that have a fatal sting, and if so, where are they located? How do you guys think of these crazy things? They are so interesting. You should do one on the most intelligent creatures (that aren't people), which are DOLPHINS!!!!!!!!!!!! Cool, I knew today's wonder was going to be on jellyfish. I think tomorrow's wonder is about why we have asthma attacks! I thought they were fish! Jellyfish are cool. When I was at Rancho El Chorro (and outdoor school where you stay the night), we went to the beach and we found a dead jellyfish on the sea shore. Dear Wonderopolis, Wooooooooooooooooow!!!! What an amazing video. I knew that jellyfish were not made out of jelly. I learned lots of new things. I think this wonder was the best. I cannot wait to see tomorrow's wonder. Wow! Loved the Wonder today. We were mesmerized by the amazing video. Jellies are so "other worldly" aren't they? Great info today! of or relating to the land next to the ocean; seashore. Scientists believe jellyfish have been around at least how many million years? Rather than fish, jellyfish are considered to be what? Jellyfish bodies are over 90% what?